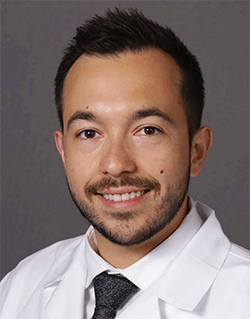 On July 30, Dr. Daniel Cortes joined the college faculty as an Assistant Professor-Clinical in the Division of Restorative Science and Prosthodontics. He earned his DDS degree from the School of Dentistry of the Autonomous University of Nuevo Leon (Mexico) in 2012, after which he entered private dental practice. In 2015, he enrolled in the University of Michigan School of Dentistry's advanced education program in prosthodontics, earning an MS degree and a certificate in prosthodontics. Dr. Cortes' professional experience includes providing general dental care, oral rehabilitation, and prosthetic care in collaboration with other dental specialists. He has also taught courses on dental materials, making and restoring dental prostheses, as well as removable partial dentures and complete dentures. His role in the college includes didactic, clinical, and laboratory instruction for pre-doctoral students. He is also involved in quality assurance that enhances the dental laboratory process in the predoctoral Comprehensive Care Clinic.